The Sumo19M large 1200nit daylight viewable 1920x1080 display will impress your directors and clients, especially with its HDR capabilities. Give them the confidence that your colors and exposures are perfectly set whether you are shooting for HDR or regular Rec.709 delivery. See Log footage with 10+ stops of dynamic range on screen by using the unique AtomHDR engine. Easily demonstrate your vision with the ability to load and display creative LUTs. Output to connected screens and devices via HDMI or HD-SDI with LUTs applied, or in HDR in HLG or PQ formats. The AtomHDR engine perfectly maps Log/PQ/HLG from popular cameras/ game consoles to SUMO19M's amazing panel, resolving 10+ stops of HDR in real-time for perfect setting. Pass-on HDR to other devices over HDMI or SDI, in HD or 4K and in Rec709/HLG/PQ. To get the best image from your sensor, you must shoot Log and only AtomHDR makes exposing Log easier, unlocking every camera's HDR potential. 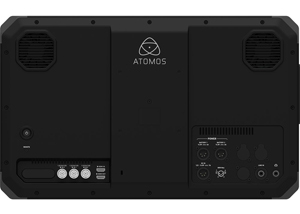 The SUMO19M inputs can be used as an editing and grading companion in the studio with full SDR & HDR support through 709/HLG/PQ. Today's productions require flexibility to perform, no matter the camera or production you MUST be able to deliver superb SDR or mind blowing HDR to your clients. Shooting Log from your camera and exposing using AtomHDR gives you the maximum latitude and flexibility in Post Production to produce the cleanest noise-free SDR image and highest dynamic range HDR. 3D LUT'S - PRECISE, FLEXIBLE AND INFINITE. Load an infinite number of custom LUT's onto SUMO19M via the HDD/SSD slot. Apply and compare looks for finishing in SDR or HDR, form your favourite LUT for your camera or from your post team for consistency across shoots. All stakeholders from customers to directors can see the creative finish live on the day! The Sumo19M extremely bright 1200nit display means you can accurately monitor, even when outside in full daylight. 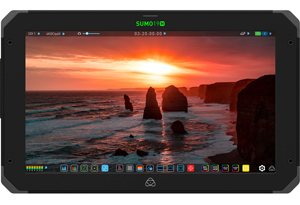 SUMO19M has a wide viewing angle so that everyone on set can review the action and also features optional calibration using X-Rite's i1DisplayPro for ongoing accurate HDR and Rec709 monitoring. The Sumo19M Aluminium alloy chassis with built-in armor houses sixteen 1/4" and eight 3/8" mounting points around the top/bottom/sides, a rear panel VESA mount and included feet for a variety of mounting configurations. The Sumo19M optional mounting plates connect dual V-Lock or Anton Bauer batteries that work in tandem with our patent pending continuous power system. Sumo automatically swaps to the second battery when power is low, allowing the drained battery to be hot swapped to ensure you are never without power in the field.